Free internet and an outdoor pool are what our guests can look forward to at Cherry Orchard Inn which also offers in-room microwaves and mini-fridges. The three-floor Cherry Orchard Inn has 64 rooms all with in-room coffee/tea makers microwaves and mini-fridges. You'll also enjoy free high-speed internet and premium cable TV. Slip into your bathing suit and then slip into the pool or hot tub. 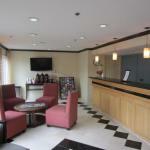 The hotel also has on-site parking a laundry facility and free access to a nearby fitness center. Comfort Inn is located just west of Hwy 82 five miles southwest of California's Great America amusement park. Downtown Sunnyvale is two miles southeast and Winchester Mystery House is five miles southeast. If you're driving from Norman Y. Mineta San Jose International Airport the hotel is six miles west.